Fol­low­ing my Sta­t­ic Shock Vol. 1 Cap­tain Atom Vol. 1 write-up, Sav­age Hawk­man Vol. 1 is up on the read list. I real­ly enjoyed the water­col­or style. This book is also a two-parter. It starts with Carter Hall try­ing to put the Hawk­man iden­ti­ty behind him by tak­ing the wing har­ness and hel­met into the woods and set­ting them on fire. This back­fires with the Nth Met­al from the Hawk­man cos­tume com­ing to life and attack­ing him, caus­ing him to black out. Carter wakes up to him him­self back in his apart­ment a week lat­er with no mem­o­ry of what hap­pened in between and his employ­er bang­ing on the door because of a wild new dis­cov­ery at work. At work, the dis­cov­ery turned out to be a tomb for a hos­tile alien force named Mor­phi­cus, which is acci­den­tal­ly released and starts attack­ing the staff. Carter jumps in to help, only to find that the Nth Met­al was actu­al­ly absorbed in his body and resur­faces as wings, armor, and weapons to help him. How­ev­er, he does not have much con­trol over it, and the alien starts to siphon the Nth Met­al mate­ri­al from Hawk­man, weak­en­ing him. Mor­phi­cus flew off, only to be brought down by anoth­er alien, and tak­en to a secret lab, where we find that the dis­cov­ery and acci­den­tal release were not acci­den­tal at all, but planned by Dr. Hog­a­rth Kane, who is col­lect­ing aliens for some­thing sin­is­ter called the “extinc­tion virus.” Hawk­man stops by and fights every­one — he refreezes Mor­phi­cus and takes Dr. Kane’s brief­case of alien sam­ples. Every­thing seems resolved, but Carter starts get­ting visions of every­one around him being undead. He learns through a mys­te­ri­ous book at work that there is an ancient arti­fact called the Mor­tis Orb that was used to fight undead, but it was hid­den away because of its great pow­er. Turns out, the Gen­tle­man Ghost wants to use the Mor­tis Orb to gain eter­nal life, at the expense of all the lives in New York, and he wants Hawk­man to find it because the Nth Met­al is some­how drawn to it. Real­iz­ing it is the only way he can fight Gen­tle­man Ghost and his phase-chang­ing spir­it attacks, Hawk­man finds the Mor­tis Orb in the grave of a war­lock out­side of the city and acti­vates it by touch­ing it with the Nth Met­al. Gen­tle­man Ghost quick­ly takes it from him and goes back to the city, leav­ing a trail of undead. Sta­t­ic Shock appears and helps stop the zem­bies, leav­ing Hawk­man to fight the ghosts. The Mor­tis Orb makes it so Hawk­man can bet­ter fight the phase-chang­ing ghosts, but the bat­tle sud­den­ly ends when the ghost of Julius Gates attacks Gen­tle­man Ghost and they all get sucked into a por­tal. 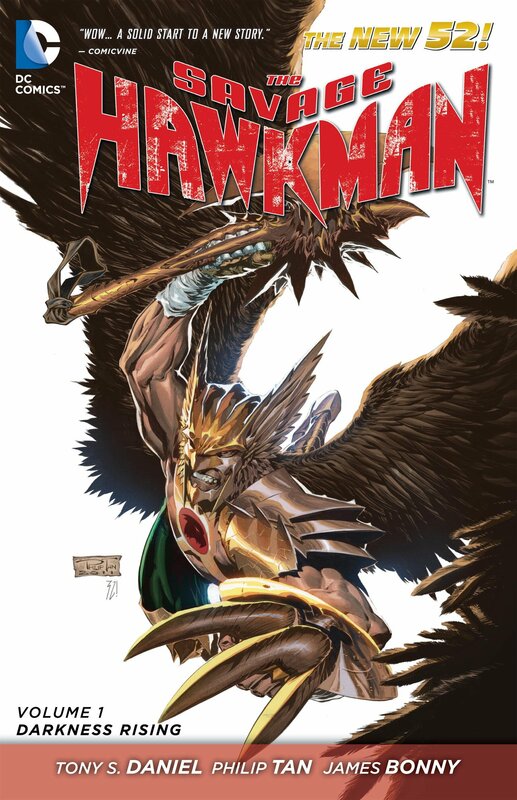 Hawk­man can­not reac­ti­vate the shield over the Mor­tis Orb, so he drops it “live” into a glac­i­er. In a sur­prise move, Askana comes to Hawk­man and asks for his help fight­ing off alien boun­ty hunters com­ing after her for help­ing Dr. Kane release Mor­phi­cus. They fight well togeth­er, but Hawk­man real­izes that the aliens are focus­ing their attack on him rather than Askana, and Dr. Kane must have con­vinced the aliens that Hawk­man was the one respon­si­ble. This book first intro­duces Katar Hol “Carter Hall” (Hawk­man), Hank, Pro­fes­sor Ziegler, Ter­rance, Emma Ziegler, Dr. Ben­son, Mor­phi­cus, Dr. Hog­a­rth Kane, Agent Mur­phy, Askana, Wak­er, Mr. Gomez, High Coun­cil Judge, Dar­ius Dig­by, “Gen­tle­man” Jim Crad­dock (Gen­tle­man Ghost), Singh, Julius Gates, Abi­gail Gates, and Tay­lor Man­ning. We are also intro­duced to the alien races of the Vexaphons, Xenu­sians, and Thana­gar­i­ans. Pan­do­ra gets her cameo in the lab fight as Hawk­man man­i­fests his new armor for the first time. We learn a bit about Dr. Kane’s orga­ni­za­tion NLAS (Non Lethal Alter­na­tive Stud­ies) and the ones who froze Mor­phi­cus in the first place, the High Coun­cil.